Steve A. Prince is a native of New Orleans, Louisiana and currently resides in Hampton, Virginia. 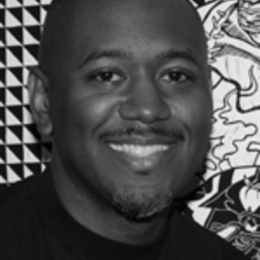 He received his BFA in Fine Arts in 1991 from Xavier University of Louisiana and his MFA in Printmaking and Sculpture from Michigan State University. Prince is the recipient of numerous awards and honors and he has shown internationally in several group, solo, and juried exhibitions. Prince is the 2010-2011 Teacher of the Year for the City of Hampton, a 2007 and 2008 Trawick Prize Semi-finalist in Bethesda, Maryland, the 2001 and 2004 Best in Show winner in the Making Waves Juried Exhibition at the Contemporary Art Center of Virginia Beach, the 2007 Partners of the Americas Visiting Artist to Santa Catarina, Brasil, and the 2008 Invisible Dignity Visiting Artist in Winnipeg, Canada. Prince has created several public commissions in various media. He created a 16' x 40' mural entitled "Communal Quilt" at the Hampton Teen Center in Hampton in 2009, he created a 15' kinetic stainless steel sculpture entitled "Song for John" in Hampton in 2008, , and a life-size bronze bust of posthumous Congressional Medal of Honor recipient 1st Lieutenant Ruppert Leon Sargent in Hampton in 2003. Prince has taught on the middle school, high school, and university level. He is currently serving as an art teacher at Hampton High School as an art teacher in the International Baccalaureate program. Prince has created several grant funded innovative art-centered programs utilizing multiple intelligences and various art processes to challenge the participants to ponder their societal position and personal responsibilities within the community and conversely the world. Prince is the co-author of the video-book "Cargo Billups Goes Looking for Lips", which is a whimsical tale of self-discovery. You can check out his work at www.1fishstudio.com. Comment Articles by Steve A.
I Pray that Generations . . .